Vea cómo cobra vida Chiang Mai por la noche en esta excursión privada nocturna. En primer lugar, diríjase a uno de los más majestuosos templos de Chiang Mai para escuchar a los monjes cantar. A continuación, podrá disfrutar de una deliciosa cena tailandesa de 6 platos en un jardín. Finalizará en el mercado nocturno de Waroros donde tendrá la ocasión de probar algunos dulces de puestos callejeros como postre. Disfrute de transporte de ida y vuelta al hotel y de un experto guía local durante todo el recorrido. Wonderful tour to start our Thailand vacation. We learned about Buddhism, how the parishioners pray, what the Monks chant about and how to make a sacrifice. We went to the night market and enjoyed exotic fruits, then walked to a very fancy hotel, once owned by the son of Anna from the story of the King and I made famous by Hollywood. The hotel was very nice, the meal tasty, and the service there above reproach. Overall a fun 3 hour tour. Awesome dinner and exposure to the culture!!! Our guide brought along incense for us to light at the temple. We stayed to enjoy the chanting for awhile then headed to dinner. Restaurant was very fancy and the food was good. Later, the walk through the night market was special. Our knowledgeable and friendly guide showed us the different fruits and vegetable which were new to us. 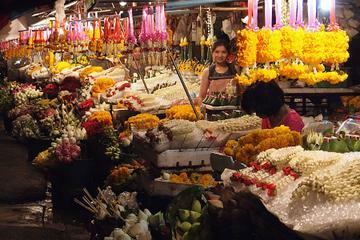 We also walked through the flower market area. This is a really nice tour! The guide was very nice and informative. I learned a lot about Buddhism and Chiang Mai from him. The chant itself is hypnotizing, I recommend the experience. The food is really good too. Tour guide lovely but hard to understand at times. Went to see the Buddhist chant, but not our night, but they found us another temple to see this. The Thai dinner was at a lovely hotel and the food was enjoyed by my friends, but it is a set menu and I struggled. The night market you can quite easily do by your self. The chanting is a nice little bit of insight into Thai culture and the night market is crazy and it's very useful to have a guide giving you insider tips. But the best thing here is the dinner, a great selection of Thai dishes in a very nice setting. It's an evening well spent. This was a great way to spend our evening. We visited a couple of the more prominent temples in the town and enjoyed hearing the monks chanting. At one, we were able to walk down to the river and enjoy the view. The market was interesting, and our guide introduced us to a few local items along the way. Although dinner was described to be out in a garden, we actually ate indoors at a lovely resort. It was cool and there were no mosquitos! The first dish that came out was very flavorful, but so extremely hot for us. We indicated this to the waiter, and the rest of the meal was much less spicy. It would have been nice to have had the spice discussion before the food was served I know we aren't the only ones who can't take Thai heat : Aside from the spice, the food was delicious. We visited the market before dinner we had expected it to be for dessert, according to our trip description, but the dessert at the restaurant was wonderful. A lovely evening. Visited a local temple at 6 pm for a real world experience with monks and local folks chanting...dinner at the very beautiful 137 Pillars house restaurant was very good...also enjoyed the non-touristy night market with local guide...learned a lot about Thai and Buddhist culture from guide...highly recommend this tour. Great evening! The evening prayers at the Wat were lovely, enjoyed the guide's tour of the Night and Flower Markets though note, this is not the Night Market with stalls selling t-shirts and knick-knacks, and the boutique hotel dinner was in a lovely setting with delicious food.